The Shrine of Our Lady of Fátima is located in Cova da Iria which is a small town in Portugal situated 88 miles N of Lisbon and 36 miles E of Nazaré. It’s a short ride from Lisbon that can last 1h30-2h30, depending on what are your means of transport to get there. 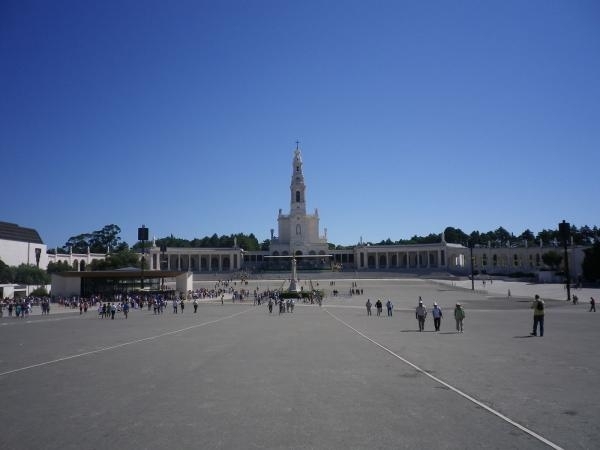 We do offer a day trip to Fátima from Lisbon that costs 59€ per person. Given that Fátima is not that large or that there aren’t so many things to see, the tour also covers other villages such as Óbidos and Nazaré. But for those that would like to get there on their own, be it by train or bus, here is some more information; information that also can help you decide what to do and how to get to Fátima. What Can You See at the Shrine? Guards at the basilica doors may stop visitors who are not suitably dressed, which means general modesty, no shorts on men, and skirts or dresses on women. Pets are not allowed, although I didn’t know this, and entered with my dog a couple of years ago (nobody complained). Inside, there are 15 altars dedicated to the 15 mysteries of the rosary as well as the tombs of the young visionaries, Francisco Marto and Jacinta Marto. The high altar painting depicts the Message of Our Lady of Fátima to the three children. Included in the painting are figures of the local bishop as well as Pope Pius XII (who consecrated the world to the Immaculate Heart of Mary in 1942), Pope John XXIII and Pope Paul VI. The four corners of the basilica are occupied by statues of men especially devoted to the rosary and the Immaculate Heart of Mary: St. Anthony Claret, St. Dominic of Gusman, St. John Eudes and King St. Stephen of Hungary. The great organ (1952) has 12,000 pipes. The other main stop for pilgrims to Fátima is the Chapel of Apparitions, an open-air chapel built on the site of the appearances. It is open year-round for regular services. Inside the modern chapel is a single white column over the site of a small holm oak tree over which the Virgin Mary appeared on May 13, 1917. Near the entrance to the sanctuary by the rectory is a Berlin Wall Monument, containing a 5,732-pound chunk of the wall – a memorial of God’s intervention in bringing down Communism, as promised at Fátima. A particularly popular site is the Hungarian Stations of the Cross, consisting of 14 little chapels leading along 3 km of inclined stone walkways to a marble monument of Christ on the cross. There are many little shops near Fátima where you can buy fine linen, tapestry, embroidery, clothes and gift of many things other than religious souvenir items. Most visitors start at Lisbon which is 125 km away from Fátima (Cova da Iria). By car from Lisbon airport, it takes about 1 hour 15 minutes to get to Fátima. The highway between the two cities is good quality and safe. Rental cars are available at the airport or other places in Lisbon. It is possible to reach Fátima by train. However, the closest train station to Fátima is Caxarias is still 10 km away. Twelve trains run daily from Lisbon to Caxarias; the journey takes 2.5 hours and costs €5.70 one way. Seven buses run between Caxarias and Fátima per day; a one-way ticket costs €2. It is therefore quicker and easier to travel the whole way by bus. Travelling by bus from Lisbon to Fátima – go to the central bus station in Sete-Rios. You can either take a taxi to the station or take the Metro to the Jardin Zoologico stop – the bus station is right outside. Buy a ticket at a ticket office in the station. Buses leave for Fátima approximately hourly from 8am to 8pm. The bus fare costs about €10 each way, takes about 90 minutes and arrives close to the shrine. Note that on bus schedules Fátima is often listed as Cova da Iria. As stated above we have two available tours for you to choose from: the Fátima Private Half Day Tour and the Obidos-Fátima Day Trip where you can book at a cost of € 50.60 and €25.96, respectively. Each tour takes 4-5 hours with an English speaking guide who will provide you answers to all that you need to know about Fátima, as well as comfortable transport and other things. Check them out and decide yourself. You can also check here in spanish “Cómo llegar a Fátima“.